1) Think first about the style of your home and the look you’re trying to achieve. Ultra modern and you might want to consider sleek tile effects or contemporary wood finishes. More traditional and you might want to consider more rustic-looking woods or traditional-looking tile effects. 2) Think next about the area to be covered. High moisture and high traffic areas sometimes call for specific floor types. You can find out the benefits of each here. Durability and lifespan always need to be considered. If you plan on being in your home for many years it’s worth investing in the best flooring you can afford – real woods and Karndean floors have lifetime guarantees and can actually help make your property more saleable – you’ll often see them mentioned as benefits in an Estate Agent’s sales particulars. 3) Consider the size and shape of your room. Small rooms look bigger when smaller tiles or narrower planks are used and can also benefit from different formats like herringbone or chevron patterns. 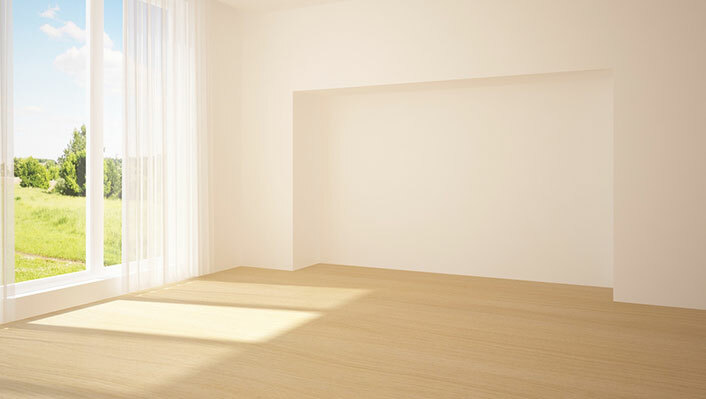 To create the illusion of space we would recommend any patterns or planks to run lengthways through the room. Larger tiles, wider boards and large panels work better in bigger rooms. In larger rooms you also have the option of mixing and matching tile and plank sizes to create a really interesting, bespoke feel for your space. 4) Think about creating a statement. One simple way to create interest in any size room is to lay planks or tiles on the angle. The use of borders, particularly in larger spaces can be a great way to ‘finish’ this look. A word of warning however, borders work best in rooms with little furniture like hallways or kitchens, or where furniture is positioned centrally in the room so as not to hide the overall effect. Alternatively, consider a herringbone, chevron or square parquet design, or patterns and panels to help create a statement floor with a luxury feel. Or use stand out tones and colours to inject personality into your floor. Inserting contrasting grout lines, patterns or mosaic borders into tile effect floors can also help you achieve the ‘wow’ factor. 5) Think about colour and tones. New flooring can be a large investment and as such, we recommend you approach your room design from the ‘ground up’, by choosing your perfect floor first then selecting furniture, kitchen units, tiles etc to complement it. We also understand that this isn’t always possible and we can help provide advice on the best colours and tones to complement (or indeed contrast!) your existing space. With Design Trained Advisors and over 30 years combined experience, take advantage of our expertise and our free sample service by calling us on 01788 815700 or calling in to our Dunchurch Showroom today.